THE EVENT: Goldwell’s COLOR ZOOM CHALLENGE 2012, held in London at Excel Auditorium. THE DETAILS: More than 2,000 salon professionals from 40 countries and 5 continents came to London to celebrate and root on the competitors of the 2012 challenge. There were a record number of entries this year: more than 2,800 international entries resulting in 460 semi-finalists, 75 national winners…all leading up to the three global winners. Dynamic colour is what it’s all about for 2013 – hot colour that pops!!! For this red carpet look you’ll need smooth, straight hair. Start by blow drying with a paddle brush and then straightening hair with an iron. 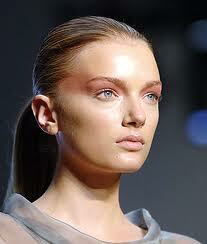 Gather into a low, slightly loose ponytail, smoothing hair and the temples and tucking it behind your ears. Some products we recommend when using a flat iron are Goldwell Colour Shampoo, Goldwell Liquid Serum, and KMS Flat Iron spray. Soft and glamourous was the look at the recent Toronto International Film Festival. The updos were simple and relaxed, not tight and over-the-top. Romantic Leading Lady – A romantic look, featuring side-swept hair gathered into a bun. To achieve the look, set hair with rollers or use a large-barrelled curling iron. Pull side-parted air back into a low, loose, bun, allowing some of the hair in front to come loose and fall naturally. Finish with KMS Maximum Hold Hairspray. It’s a great product that finishes the style, without weighing the hair down. It is fantastic for keeping updos and curls in place.